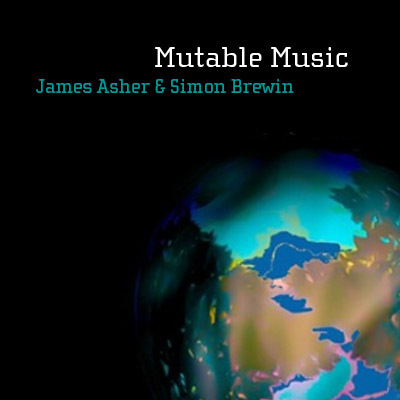 Mutable Music by James Asher and Simon Brewin. I first met Simon as a bass player/guitarist playing with keyboardist Big Al`s Boogie Woogie Trio. It was immediately clear to me that not only is he a very talented player, but a very flexible and varied one too. Over the past year we have been co-writing and it has been a delight to unpack some of those diverse layers of creativity I first sensed in his playing. `Turn up the bass` is a common call when we are working, and this is not surprising as Simon plays awesome bass, an eight stringed fretless in fact. Guitar, whether, jazzy, funky or lyrical is another of his strengths, but he also plays great keyboards, harmonica, sings and is a lyricist too. Wow! Simon joined me on my Indian Taj Palace performance along with Howlin` Blues, has also played with me in the Drum Mantra gigs in London and has become an integral part of the Drum Travel project with Sandeep Raval soon to be released. We have recorded music in a range of styles – jazz, funk, shamanic, pop and cinematic. It seemed fitting to celebrate this first year of collaborating with a debut release. The title seemed fitting because I wondered how to express my delight at the range and scope of the music, and it occurred to me that part of what helps explain this is that we both enjoy mutable astrological signs. Simon is Gemini and I am a Virgo. For those not familiar with the term, the quote below from the website About Astrology, explains. Where does the name mutable come from? It’s Latin root is mutabilis which means change, and its related to the words mutate and mutation. Mutable signs are the chameleons of each element, able to shift into many forms, and take on different persona. What are the characteristics of the mutable signs? They’re flexible, adaptable and thrive on change. Their swift changeability allows them to see life from many different perspectives. Mutable signs have a restless nature that comes from being the breakdown before the breakthrough — in preparation for the end of the season. They bring people and ideas together in an innovative synthesis.It is appropriate to comment at this time that musical categories exist to help listeners find and identify music they like. They are not there to impede or restrict the artists from expressing the full range of their musical imaginations, or to confine the boundaries to narrow lines and limitations. Approach this album with an open mind, and if you love good music, are sure to be delighted.